This particular client is a unique web service platform that takes pride in bringing crowdfunding to a different level. The platform allows users to register an ‘experience’ (campaign) and provides a means for friends and family (donors) to contribute monetary ‘gifts’ (donations) to help fund it. 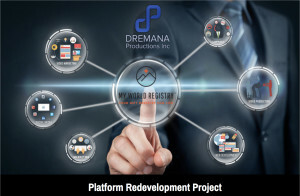 Dremana Production’s role is to integrate a ‘marketplace’, where users can select experiences from a variety of vendors, select and modify the experiences, or buy them outright.